Ask the Vet: Can Dogs Get Sick from Chickens? Let’s face it: dogs are inquisitive animals and they like being around other farm animals, so you may be wondering whether dogs can get sick from chickens. This question is a good one considering that poultry have been known for transmitting various diseases to humans. 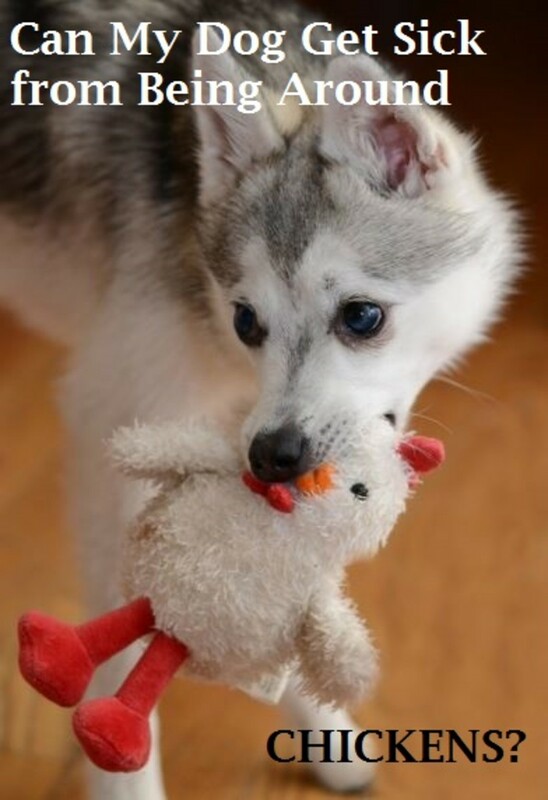 In dogs, things can get even trickier, considering that many dogs not only like to be around chickens, but they also enjoy eating chicken dropping, (yeah, pretty gross, especially from a human perspective!) which brings health concerns to a whole different level. So we asked veterinarian Dr. Ivana Vukasinovic whether chickens can make a dog sick. Can Dogs Get Sick from Being Around Chickens? Just being around chicken won’t get your dog sick; for starters dogs are not susceptible to avian influenza (AI) viruses. But, close contact and eating chickens poop can give your dog a number of different diseases. Birds that live in good conditions and are treated according to the principles of good veterinary practice generally do not get sick but sometimes even they can carry diseases. What exactly is aspergillosis and how does it affect dogs? This fungus is often found in wet and dirty bird cages, and therefore, good hygiene is the primary strategy for prevention of the disease . The disease affects dogs by attacking the dog’s lungs and respiratory system. Histoplasmosis is another fungal pathogen that affects dogs through the same way as aspergillosis. Dogs usually ingest the fungus when they eat or inhale contaminated soil or bird droppings. The difference from aspergillosis is that the target organ in this disease is the digestive tract rather than the respiratory system. Coccidiosis is a parasitic disease of the intestinal tract of many different species of animals caused by protozoa. Dogs can get coccidiosis from eating the droppings of coccidia-infected chickens. Can dogs get salmonella from ingesting chicken poop? This bacterial disease is zoonotic, which means it can be transmitted to humans; both dogs and cats are susceptible to Salmonella species. Your dog can get sick from eating the droppings of sick chickens. Dogs can get salmonella from eating chicken too i it’s raw or improperly cooked. Before eventually becoming director of Vetanima Doo, company that sells animal food, medicine and supplements, she has worked in many different fields of sales. After finishing college, she started working as sales person in the biggest Serbian bookshop chain, and being passionate about books, she had reached the position of publisher.